The Euro also reached an all-time high against the Russian national currency at 49.03 rubles in Wednesday morning trading on the Moscow Exchange (MOEX: MOEX). The ruble had slumped 22 kopecks to a record low of 41.65 rubles against the bicurrency basket ($0.55 and EUR 0.45) by 10:34 a.m. Moscow time. The dollar had hit its own high of 35.62 rubles/$1, up 21 kopecks from Tuesday close. On Wednesday morning the dollar had risen in unified trading to its highest point since March of 2009. “But the main reason is the intention of the Central Bank to let the ruble fall, which ultimately should lead to the fact that the value of the ruble will be formed by the market forces and will not depend on the Central Bank,” Shein said. The Central Bank pushed the bicurrency basket corridor up 10 kopecks to 34.8-41.8 rubles Tuesday evening. On Wednesday morning, the value of the basket was at roughly 15 kopecks from the upper bound of the corridor. Pressure on the ruble intensified after yesterday's news that the Finance Ministry plans to be buying foreign currency in the next couple of months. 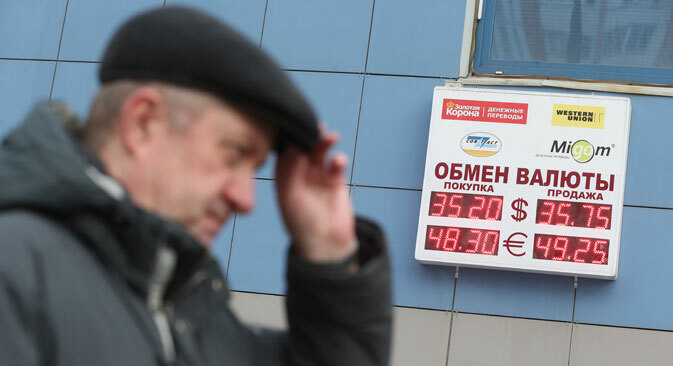 But experts argue that the Finance Ministry’s announcement could not affect the ruble. According to Petronevich, there is a psychological factor to this slide, and the ruble is likely to bounce back. “Most likely, the ruble will return to its previous position. I won't surprised if we see 34 rubles per dollar in April,” agrees Shein.